It was said that the man who could look into Silvi Ivarsdottir's eyes would be meant for her. Powerful jarl Magnus Sigrundson knows he is that man, and that Silvi's dowry can give him the ships, swords, and silver he needs for his trading empire. Yet beautiful Silvi's dream is not to be a wife, but a Priestess of the gods for the great temple at Uppsala. Who dares interfere with such passion? The answer lies in Silvi herself, in the way her body awakens to Magnus' touch, in the way she inspires a reverence he didn't know he possessed—and in the battles she takes on when she journeys to his mountain home of Thorsfjell. But soon a dangerous, deceitful enemy threatens to shatter. Now they face another quest: can they find each other again—and dare live and love in each other's worlds? Sabrina Jarema's Norse inspired Viking Lords series continues with Lord of the Mountains. Eirik Ivarsdottir's village has been cleared of thugs and he is nearing the end of his marriage celebrations. His wife's brother, Magnus Sigrundson, is preparing to head back home, but not without taking the chance to persuade Silvi Ivarsdottir to visit Thorsfjell. Silvi, on the other hand, is stubbornly determined to give herself to the gods and become a priestess at Upsala. Her family has other intentions for her. The story concept is great, but I wish there had been more fire in Silvi. I didn't immediately love her and honestly by the end I thought she was just okay. There seemed to be some conflict in her character, because her mother and brother believed she was strong based on the fact that one had to be in order to channel the power of the gods, but she acted very naive and needy and just didn't show that strength well. Magnus was a rock throughout and proved time and time again that he was worthy of Silvi's love. I did enjoy watching their romance unfold, because their love was not immediate, or easy. 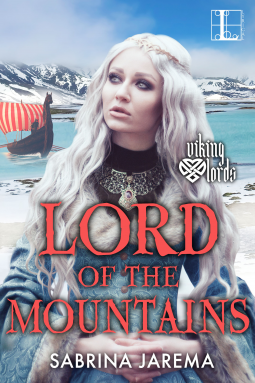 Lord of the Mountains made me feel like I was reading a contemporary military romance transferred to another time and place. Readers follow the warriors into battle and get a sense of their strength and ideals, while entertained by the antics of two people navigating the rough waters of an uncertain relationship. Overall, I enjoyed Sabrina Jarema's style and attention to detail. I have no inkling of Norse culture, but I was able to easily envision the story and believe Silvi had once walked upon the lands of Norway. I'm eager to continue the series to see what other angles she can work from this fascinating group of people, because she definitely laid out the possibilities. Lord of the Seas will no doubt be an interesting addition to the Viking Lords series!